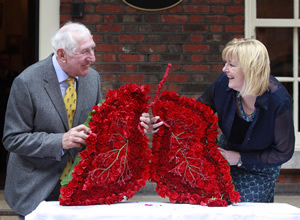 The Irish Lung Health Alliance is delighted to announce that Dr Ronnie Delany, renowned Irish Olympic Champion has joined the ‘Love your Lungs’ campaign as an ambassador. Given Dr Delany’s sporting achievements, he is a perfect embodiment of the link between good lung function and athleticism. He won a gold medal for Ireland in the 1500m in the 1956 Olympics in Melbourne. He then went on to win an unprecedented and unsurpassed 40 straight victories ‘indoors’ in America from 1956 to 1959. He became one of the first ‘Four Minute’ Milers in Compton, California in June 1956 and was the ‘Mile’ World Record Holder from 1958 to 1962. Dr Delany was the first Irishman to win a medal in the European Championships 1500m in Stockholm in 1958. “We know only too well how dependent athletes are on good lung function. What’s probably less well known is the reverse – the role that sport and physical activity can play in preventing lung disease and in improving quality of life for people with lung conditions. It’s therefore very fitting that the Irish Lung Health Alliance and the World Spirometry Day Campaign have chosen this Olympics year to launch their campaign, said Dr Delany”.